Working Out Loud is a global movement to share and narrate observable work with a purpose. 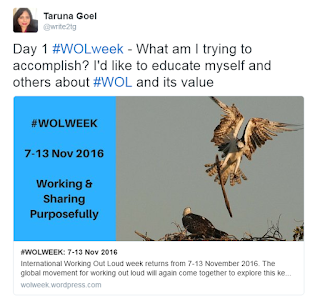 This year, I participated in International Working Out Loud Week (#WOLWeek 07-13 November 2016). The idea of this week was to share a reflection on a different element of working out loud each day. I followed the WOLWeek blog that used John Stepper’s latest iteration of the five elements of Working Out Loud as a guide to those reflections. Day 1: Share purpose - Working out loud is about sharing your work as it progresses so that others can learn and can help. The first question raised by Working Out Loud in John Stepper’s view is “what am I trying to accomplish? So, I started Day 1 by sharing my purpose. 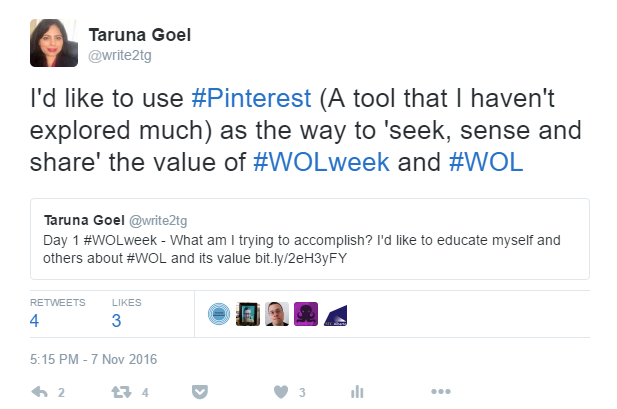 During the WOL week, I wanted to educate myself and others about WOL and its value. I have worked out loud at many occasions both in my personal and professional life. During this week, I wanted to use Pinterest as a way to create opportunities for social collaboration and share my contributions related to the concept of Working Out Loud. Using Pinterest was an interesting (and unexpected) choice for many. When I had initially thought of using Pinterest, one of the key mindsets that I wanted to get rid of was that Pinterest is a crafting tool. I knew the potential of Pinterest and had seen some excellent resumes and work portfolios on Pinterest. I had also enjoyed Jane Bozarth’s board on ‘Show your Work’. But I hadn't truly 'used' Pinterest to do anything constructive. And I wanted to change that. I also found pinning a passive activity. So, I wanted to take it to the next step and invite others to collaborate and pin on my WOL board. I wanted to see what others have found valuable when it comes to working out loud and sharing their work. 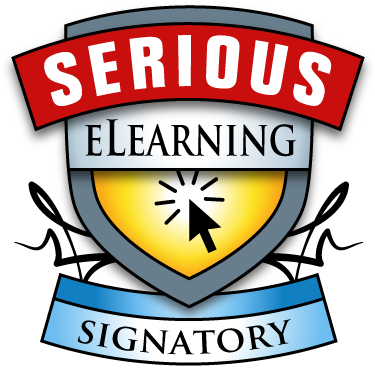 I wanted to see real-life examples and application of WOL and share all this knowledge with folks who may not have started their WOL journey as yet. So, I decided to use Pinterest as a way to facilitate this conversation. At the end of Day 1, I had built a Working Out Loud Pinterest board and captured some of the underlying concepts related to Working Out Loud to get myself started on this journey. Day 2: Make A Connection - Working out loud exposes us to the networks of other people in our work. Understanding and leveraging those networks begins by making a connection. For Day 2, I decided to send tweets and direct messages to people in my PLN inviting them to collaborate and add a pin on my WOL board. And twitterverse responded! @Rob Jefferson was the first to chime in and gave me the encouragement that I needed to keep going (Thanks Rob!). Day 3: Make a Contribution - Generosity is a core element of Working Out Loud. With our purpose and communities in mind the best way to begin a relationship is by making a contribution to others. For Day 3, I shared my own example of WOL in my current project - a transparent project monitoring technique using an XLS-based visual project tracker. I shared it on twitter and then pinned it to the WOL board. Day 4: Share Progress - Real progress is not measured by our efforts but by the shared progress for others. Work out loud to better understand progress. 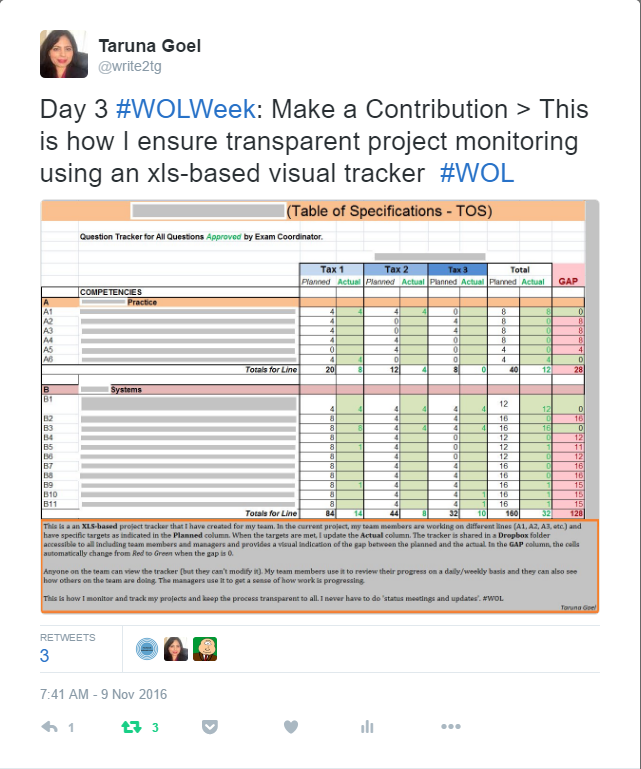 For Day 4, I extended a warm thanks to all the collaborators and shared with them how the WOL board was coming along. But I wanted to do more. I wanted to have a conversation with the collaborators on how we ALL were doing and if the board was of value to them and to others viewing the board. I was also asking them if Pinterest was a good choice. Day 5: Share A Need - You need help. Your stakeholders need help. Working out loud is way to come together to share needs and solve them together in community. 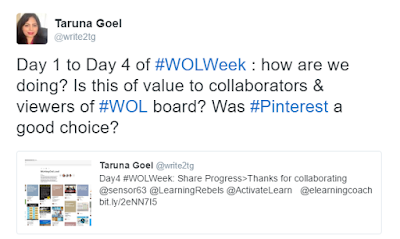 On Day 5, I invited and reminded folks in my PLN to add to the WOL board to make it more valuable for everyone. I also heard from many folks about their own examples of working out loud and some of the articles, videos and posts that they have found useful along the journey. I made sure to pin all those resources on the WOL board. Day 6: Celebrate Help - The best celebrations are purposeful. They are shared in a community. Reflect on your work. Whose contribution to your work deserves a shared celebration? Take 5 minutes to thank them properly, deeply and out loud. That’s a celebration that doesn’t fade, but instead grows. I thanked all the folks who showered my tweets with Likes and RTs including @WOLWeek @STCAlberta @tmiket @LeadershipABC @simongterry @margiemeacham @lrnchat @claremil_BBS @SalmaAfzal_ @wol_de @ryantracey @brunowinck @eLearninCyclops @jenfrahm and many others. I thanked @WOLWeek @simongterry for creating such a wonderful #WOL community that is ever willing to share and encourage! Day 7: Plan Next Steps - At the end of a busy week take some time to take stock. Reflect on what you learned working out loud this week. To get a sense of everything that happened in that one week, I drafted a twitter moment (my first!). Finally, here I am! 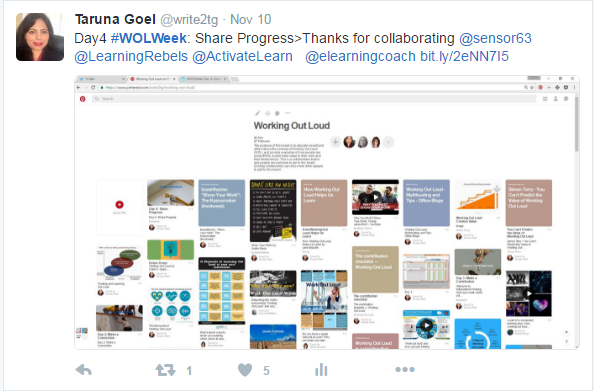 I am now using this blog post to reflect on what I learned by working out loud during the #WOLweek and what I have learned about what is and what isn’t working out loud. 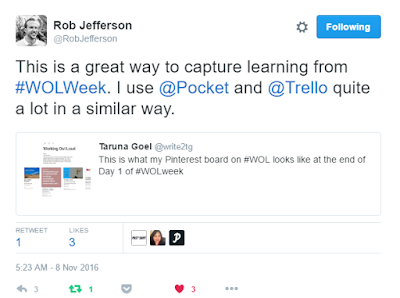 WOL is not about the tools and technologies used for sharing and collaboration. You don’t need to be on social media to WOL. WOL is not about pushing content and information to people who are not interested in receiving it or to those who don’t share a common purpose. WOL is not about self promotion. WOL is not about using one approach that’s always right. WOL is not about fault finding in other’s work. WOL is about starting with a purpose. If there isn’t a purpose behind sharing and collaboration, the act of narrating and sharing your work may not be very valuable. WOL is about being generous and making your work visible and accessible. The idea is to enable and encourage others to have a conversation around your work to provide feedback and to share new ideas about what’s possible. WOL is sometimes more about the process of sharing rather than the final outcome in terms of the actual work product. WOL offers a way of establishing connections with others more easily using the common, shared purpose. These connections can lead to valuable relationships. WOL is about an open mindset. It is an integral part of the working culture and it is about one’s willingness and attitude to share and to go beyond the fears of what others will say about their work product. 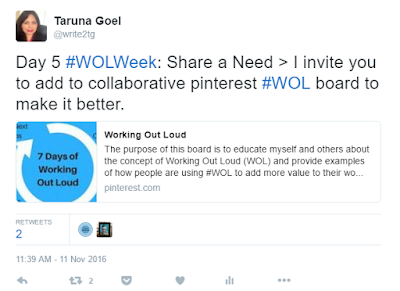 With this post, I would like to invite all collaborators of the WOL board to share their comments and feedback on working out loud with me during #WOLWeek. 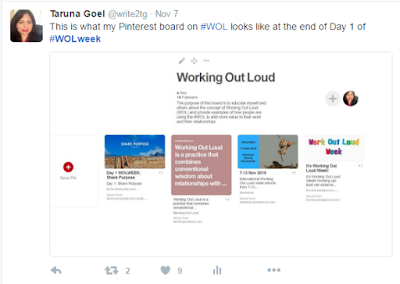 - What did you think about using Pinterest as a way to work out loud about working out loud. 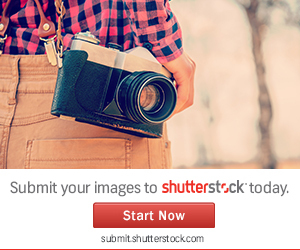 - How was your experience pinning articles and other resources on a collaborative board? - Have you had a chance to visit the WOL board since #WOLWeek? - Do you find the board valuable for yourself and others? - Have you shared the WOL board with others? 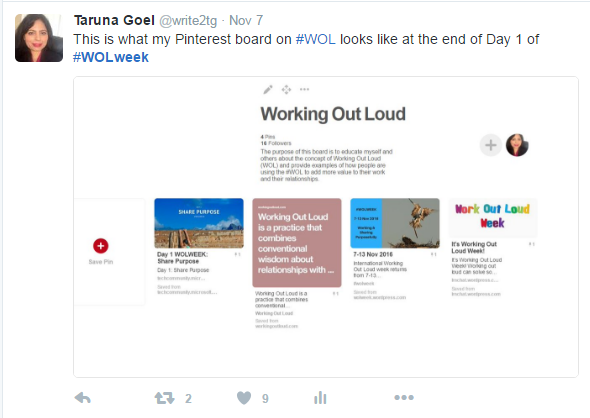 You can now find 50 valuable pins that point to articles, blog posts, videos and examples of Working Out Loud in action all on one WOL board. Would you like to contribute and add a pin?